Why does canning my own tomato sauce feel like an act of rebellion? Can I not just buy canned tomato sauce (or paste, or diced, or whole or whatever) more quickly and cheaply than spending hours cutting and peeling and standing over boiling water? Why in the world would I want to do this? Why do I fix my own bikes? Why do I cook my own meals? Make my own computers? Grow my own vegetables? Ride my bike in all weather? Why do I want to live my life? Do for myself? Continue learning -- and by learning, I mean learning by doing and not learning by watching TV and "learning" about some subject. I want to do for myself. To fail as I did when I first started canning these tomatoes -- I forgot the lemon juice. I had to pour all the jars back into the cooking pot, add the lemon juice and start all over again after cleaning out the jars. Do I need the lemon juice? Intellectually, I think I don't, but I've never canned tomatoes before, so I follow the directions, pour out the canned tomatoes and start again. I don't know. Maybe next year I'll know, but right now I don't. I follow the directions, I learn the basics and subsume my ego, myself. I try to find Beginner's Mind. I learn, I listen (or read) from those who know. I've never canned. I have ideas, but I've never canned and My Ideas Don't Count. I learn. I fail. I succeed. I have 7 quarts of tomato sauce. At what cost? 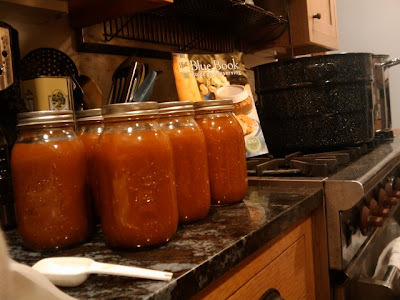 I could have purchased tomato sauce for much less than the canning jars, tomatoes, lids, water, gas and pots needed. I would still be ignorant, I wouldn't have failed. I wouldn't have forgotten the lemon juice. I wouldn't have spent the time feeling the tomatoes, cutting the stems and bad bits away, smelling the scent as they collapse in the pan, sweated over the boiling tomatoes and jars. I wouldn't have forgotten the lemon juice. I would just have cans of tomatoes. An ingredient, nothing more. I wouldn't have learned anything. Now I know about lemon juice and hot jars and stirring and smells and sweat and I appreciate my sauce. It now has more meaning than just something that you pour over noodles. Something in which meatballs swim -- there's a lesson, some life's meaning. Easy doesn't mean much, you don't learn, you never care, you don't remember. Tomato sauce, jams and pickles and mustards. Living life with what is vibrant now and capturing it and the smells and sights while still vital and fresh. Not the safe, comfortable, easy way. I've subscribed and will be following your blog with much interest.